If you’re a pizzeria owner, you’re probably no stranger to conveyor ovens. Traditionally conveyor style ovens have been used for high-volume pizza joints, but recently many restaurants are utilizing them for hot sandwiches, burgers, and even baked goods! True, conveyor ovens can improve your kitchen’s speed, durability, and overall efficiency, but these ovens are sometimes taken for granted, and the basics of proper installation, operation, and maintenance can get left by the wayside. Maybe you’re new to the conveyor oven scene, or maybe you’re improving or upgrading your current unit! Either way, paying attention to proper installation can make or break the success of your new oven. 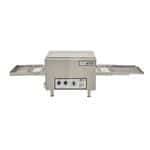 Conveyor ovens have a large footprint in the kitchen, both vertically and horizontally. These ovens need not only hood space but also proper airflow, and many times one or the other gets forgotten. If your kitchen is tight on hood space, consider a model approved for ventless operation. Sacrificing airflow for hood space can spell an early demise for your unit, so make sure that it has sufficient room to breath and cool off its components. The base in which your unit is installed on should be approved to hold the appropriate weight, and the unit itself should be secured to the base. You don’t want your machine pulled off of its base by a snagged employee shirt - it could destroy your unit and cause some serious accidents! Consider that some units are suited for table-tops while others require their own base - and choose the appropriate model for your restaurant’s needs. A tabletop model may be better for a small operation while the larger counterparts are best suited for pizzerias. Don’t forget the horizontal footprint, as it extends beyond the reach of the oven itself. Your employees will need ample access to both sides of the oven, so understand that the length of the oven is not the minimum space you’ll need to allot! Consider that the entryway for your unit is open at all times. Sometimes, unintended objects can make their way into the belt, causing foul odors and potent smoke. Before turning the machine on, ensure that all items on top of the unit are removed to prevent them from accidentally falling onto the belt for a hot ride. Similarly, make sure your employees are vigilant of the rogue spoon or tossed lid, as these are typical offenders. While many items like pizzas have a smooth, firm bottom, some other items like chicken, burgers, and sandwiches can be a messier situation. Invest in pans or baking sheets to keep debris out of the inner-workings of the oven and to prevent buildup of grease. This small step will have a huge impact on the maintenance of your oven! If you installed your unit with maintenance in mind, then you’ve already taken the step to install electronics in an easily-accessible area. While these electronics are usually used only in rare circumstances, there are other aspects of maintaining your unit that should be done daily. On a daily basis, check the fans and airflow to ensure that your unit has an unrestricted air pathway. Brush the belt off and clean the crumb trays every evening to keep it free of debris. Always remove items from the top of the unit before turning it on, and stay vigilant of stray kitchen utensils. On a weekly basis, you can remove, soak, and scrub the belt itself. Ensure that the settings on your unit such as speed and temperature are appropriate for your restaurant, and clean the interior. Depending on your restaurant, professional maintenance may be needed anywhere from once every two years to twice a year.